Showing results for tags 'golf r'. Akrapovic Exhaust - Aftermarket Installation? Morning everyone, Has anyone else had any luck getting any information from Akrapovic regarding ordering the exhaust as an aftermarket option? I have finally received a response from them saying the downpipe will be available to order in a couple of weeks time. I am more interested in the full system though! Bought my golf r in late october with 23k on it. Mods so far: R600 intake Sachs sintered uprated clutch CAS res delete Powdercoated exhaust tips gloss black BBS VZ 18"
Hello everyone, After recent topics and discussions that I saw on the forum, I think it would be great to get a meet organised, booked and in the diary for 2019. With Christmas coming up, I'm sure a lot of you will be working and/or have ran out of annual leave. Now here comes the difficult part, where to hold it and when to do it. I know as a forum we have people from all over the UK, so I'm thinking of somewhere maybe Midlands area maybe Derby/Nottingham, accessible to motorway routes, giving you guys and girls the best routes without being massively far away. In terms of the meet itself, I'd be apt to have this on a weekend morning, so it doesn't take too much out of peoples day, and it's a lame excuse to grab some breakfast and to have a natter. So the general plan would be, to meet up at a Toby Carvery or the like, meet for say 9.30/10.00 am - have a natter prior to going in to getting some food, then back out after a hearty breakfast for another chat, then away we go. Who would be up for this? Obviously we have a bit of time before it, so it gives enough notice to clear diaries and the like. Answers on a postcard, dependent on the outcome, there will be updates. So I own a 7R and have driven a S3, both felt pretty similar to drive but the Audi steering feeling a bit vague IMO Has anyone driven the Cupra 300? If so how does the driving feel compared to the S3 & R? I have only seen 2 on the road in person. I know they are all virtually the same car underneather and just tarted up but would be interesting to hear about the driving feel, I’m sure I can remember reading the seat has sharper handling. The interior on the seat though 🤢🤢😂 but I suppose you get what you pay for... For me the S3 saloon exterior is king but I prefer the Golf interior layout far more but it’s without question that the Audi is the better quality interior. I have recently upgraded my 2015 R manual folding mirrors to original electric ones taken off a 2016 R. the mirrors and switch are all original parts, the install was pretty easy and I have successfully got the mirrors working (folding via switch, auto folding when car is locked, demister and reverse dipping etc) The upgraded ones include puddle lights which fail to turn on when folding in or out. I was wondering if anyone else has faced this issue before? I don't have puddle lights on the doors, just a red reflector at the bottom so would this be the cause of the issue or would it be something else? does anyone know the fuse number for the puddle lights? Currently have a slow puncture so time to finally look at upgrading from the Bridgestone Potenza's (225/40/R18 Y). So far looking on Black Circles i've narrowed it down to the following: 1. Michelin Primacy 4 (Rolling Resistance: B, Wet Performance: A, Noise: 68dbs) - £110 2. Michelin Pilot Sport 4 (Rolling Resistance: C, Wet Performance: A, Noise: 71dbs) - £111 3. Goodyear Eagle F1 Asymmetric 3 (Rolling Resistance: C, Wet Performance: A, Noise: 67dbs) - £94 My budget cuts off at around £110 - 120 per tyre and I think I'm only upgrading the front 2 this time around (money reasons) Thoughts and experiences or suggestions would be very much appreciated! Burger Tuning is a US based company that specializes in advanced plug and play units. The company was formed in 2008 and has predominantly focused on the BMW market where we have had great success. Our units power the strongest OEM turbo BMW's and hold records across all the models. More can be viewed at our website www.burgertuning.com. We would like to introduce VWROC users to our latest offering and entry into the VAG Group market which we entered a year ago after two years of extensive development and testing. The Burger Tuning JB1 is a plug and play solution offering simple at home tuning without requiring ECU access to achieve power goals. These units are now available and a ready for order at http://burgertuning.com/vw_volkswagen_Group1_JB1_tuner.html with a retail price of $379 plus $35 for the optional data cable. The JB1 is a true plug and play tune offering safe and adjustable gains. It can be installed and removed in minutes. The unit ships with a base setting in map 1 that increases the boost by +4.8psi over stock that is safe to be used with 95RON and up. The typical power gains on the setting are 55hp and 70ft lb. With higher octane accompanied with bolt ons and octane we have seen gains of 85hp and 90ft lb in Map 1. All of this whilst keeping the engines stock fail safes in place. Install instructions: Install instructions can be found here: http://burgertuning.com/instructions/S1_VAG_EA888_G3.pdf User interface software: For users that have opted to purchase the optional BMS Data Cable you will need to download and install the Windows user interface at this link http://www.n54tech.com/flash_files/jb4_interface.zip For MAC there is a 3rd party interface that seems to be working well on the JB, it can be downloaded at the bottom of post 1 of this thread http://www.n54tech.com/forums/showthread.php?t=21742 Directions on how to connect and change firmware: Directions on installing the interface and connecting to your JB can be found here http://www.n54tech.com/forums/showpost.php?p=197021&postcount=1 Firmware is what runs the JB1 unit. As we release updates or new firmware versions this can be uploaded to your unit free of charge. A tutorial for software installation as well as map changing and settings can be viewed here: http://youtu.be/MjQjMWBVve4 Map selection: In order to change the map in the picture below under the logging tab you can pick the required map. Under status the unit must show connected. This is done by clicking file and selecting connect. Upon shipping the following maps are active: Map 0: Stock with complete pass through i.e. the JB1 does nothing Map 1: Optimized tuned map, this supports 91 octane at the base boost setting as well as bolt ons. Map 3: Map three allows the JB1 to be the methanol controller working as a fail safe cutting boost if lack of meth flow is detected. You will require a Coolingmist FSB to get this working. Map 6: User adjustable boost profile (see below) Active on units that ship 30.09.2015 and after. If you have previously purchased your unit before reading this please email me [email protected] to receive a copy of the firmware. This map comes preset with low torque settings that are suitable for manual cars. Map 1 Boost settings: Below is a diagram of where the user adjustment is made for boost over stock circled in blue. Add in the value and click save. Map 6 boost setting: For map 6 you will need to connect to the unit and select map 6. If you have previously purchased your unit before reading this please email me [email protected] to receive a copy of the firmware. On units that ship from 30.09.2015 there is no need. If your unit has a exposed blue wire you will need to email. Below is where you enter the values for map 6 circled in orange. It works similar to map 1 so the value is the additional boost over stock. The unit can log boost the elevated boost on the two sensors, ECU boost as well as the rail pressure. The balance of the engine parameters and settings in the picture are exclusive to the yet to be released JB4 but it gives you a idea of what is to come. Users with boost gauges that are working off the OBD signal will only see stock boost. If you suspect you triggered a engine light by unplugging a sensor by not waiting for the car to go into sleep mode rather clear faults before a dealer visit. This thread can be used for support queries but its best to email me [email protected] and include model, fuel used and hardware on the car. Burger Tuning is a community based company so feel free to ask any questions you have on this thread as it will assist others too. What a day..Purchase Gone Wrong. After 2 years, I’m swapping my R out for a Yeti, the model I swapped out when I bought the R. It’s been mahoosive fun, but I need something a lot more practical and economical now I’ve retired. It was an itch I needed to scratch and upgrading it with a Revo Stage 1 map and carbon induction kit certainly helped. I’ll miss the insane acceleration and excellent handing, somehow I doubt I’ll be taking the Yeti around Snetterton....... I just need to sell the induction kit now. Suggestions? Hi lads thinking about getting a bigger turbo v5 turbo technics anyone topped it to its limit yet or know what it is?? I recently purchased my JB4 box from an approved dealer in Sunderland. I had to re install after removing it to go in to dealers from a local tuning specialist After re installing as per instructions it doesn't feel like it's running as it was prior. I'm not sure if it's resorted back to Map 1 as it was initially on Map 6. To test it I lined up with a friend who I would comfortably beat in his S5 but couldn't pull away under same conditions. Even prior to this it didn't feel the same. I was wondering if there is a quick way to check to see if it's on correctly and working as it should be doing. I have only owned it for 6 months. Only other mod is a res delete and has always been run on Map 6 on 99 ron. I have been asked to check OBD is connected correctly which I have double checked. No USB data cable or Bluetooth module. Have also ran the vehicle with the OBD disconnected and it was running exactly the same pre and post. Any advice or help would be greatly appreciated. Hi guys kinda new here so hope im doing it right, looking for someone in the Manchester area to turn my sound actuator down? Wrong bumper on Golf R? 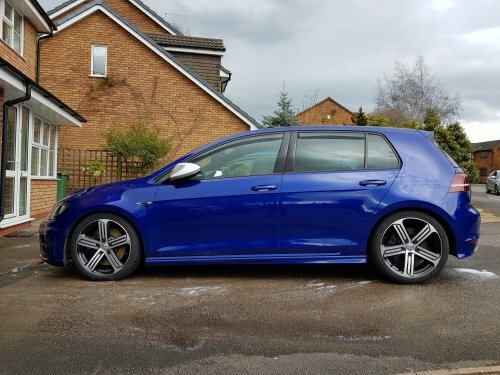 **** CAR NOW SOLD **** I am selling my 2014 Golf R (mk7), the car is in great condition and has always been treated well. i.e. It is alsways washed with 2 bucket method and sealed with FK1000P. The car has been treated with great mechanical sympathy since new i.e. strictly following manufactures run-in guidelines, and the car is not taken above 3000rpm until oil temperature is above 80degC. Spec 5 door DSG Lapis Blue Black Vienna Leather Discovery Pro Navigation - with speed camera location database loaded DCC Rear view camera door sill protectors (front and rear) privacy glass boot liner rubber floor matts 5 yrs extended manufacturer warantee (transferable to new owners), warantee runs until July 2019 Climair Wind deflectors (can be removed from vehicle if buyer doesnt want them) VWR sports springs (original vw springs also included with car free of charge) The car has no outstanding finance and has never been involved in any accidents/crashes. In keeping with treating the car with mechanical sympathy, I had the DSG Service and Haldex System services (several hundred £'s) carried out whilst having the 3rd year service - therefore the 4th service would only require a standard service. All services have been carried out at a VW Garage. Car currently has 26124 miles on the clock, but this will increase slightly each day as it is used to comute to work (approx 15 miles a day). Hello people , acquired a new vw golf R 7.5 dsg Lapiz blue metallic Registered today on forums hi guys !!! Good afternoon everyone! I have just moved over from a BMW 320d to an 8 month old Tornado Red Golf R Estate as I needed more room for the kids and all my photography gear in the boot. Ive driven diesels most my days so this is a definite change in driving style, performance and economy....but one I love! This forum is such an extensive library of knowledge and have learned so much already in the short space of time ive been a member. I believe my Golf is fairly standard in spec with just a few tweaks by the original owner but have contacted Volkswagen who are going to quote and arrange a retro fit of Discover Pro infotainment system and app connect code.....I believe... Whilst Ive no interest in performance mods at the present time, if anyone can offer advice on anything they think theyve found useful for their own car id appreciate the advice. Great to meet you all and look forward to scouring more though the multitude of posts.